Not a _____ of decency. Back to the _____ board. Bite _____ more than you can chew. Drastic times call for drastic _____. Every cloud has a _____ lining. 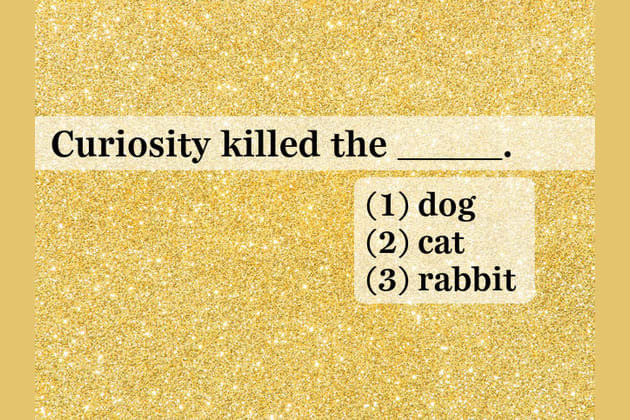 Hit the nail on the _____. Don't give up your _____ job. Not _____ with a full deck. Let the _____ out of the bag. Put _____ over other people's eyes. Take it with a grain of _____. WOW!! You're in the top 6%. You are phenomenal!! Only 6% of Americans completed these American idioms and phrases. You are an exceptional thinker. You automatically read letter combinations and scan through texts without losing your focus. You have a purpose for reading, and you subconsciously monitor that purpose while reading a text. You catch satire and puns, and you can usually predict what is about happen in movies and books. Let us know below if we are spot on. You failed the test. But the good news is - you are part of the 94%. Share the news with the world.